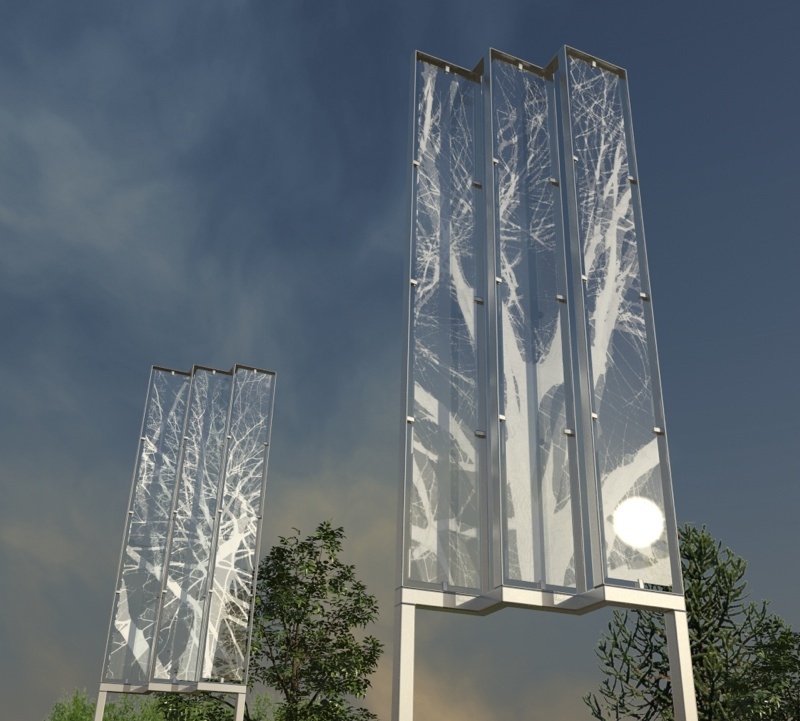 Widgery’s new design for the bridge features elevated, stand-alone louvered glass columns that are etched with images of trees – three on each end of the bridge, on the north side of Stadium Boulevard. 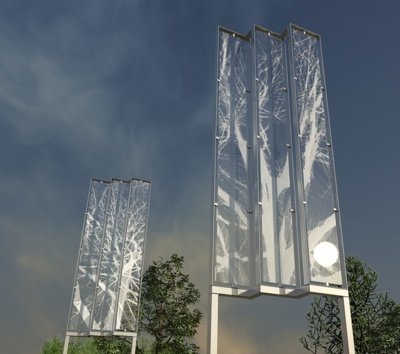 The metal support structures are 7 feet tall, with the glass columns rising above that for a total height of 22 feet. 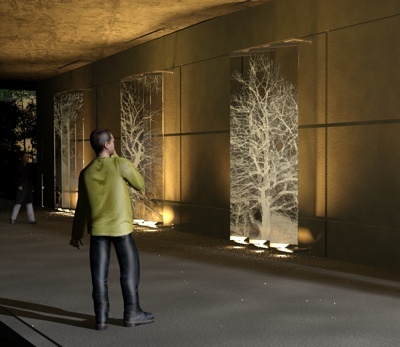 The same type of louvered glass panels are also used under the bridge along South State, affixed to the wall of the underpass – five sets on each side of South State Street. 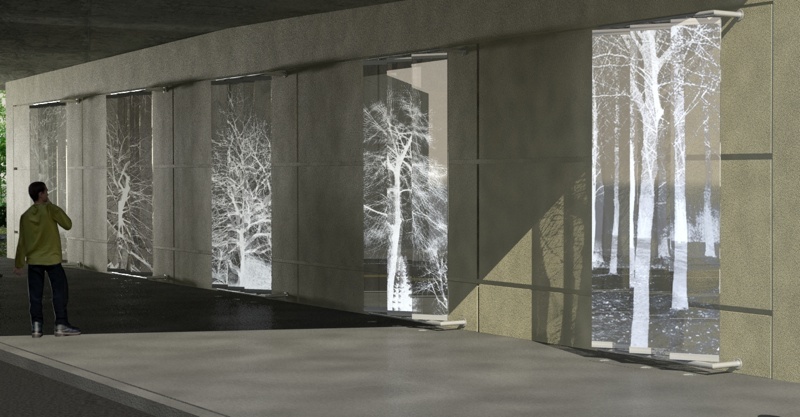 The panels will be lit from below, so that the etchings stand out at night. The glass is tempered and laminated for strength. As one drives around Ann Arbor, the gracious stands of trees stand out as a clear expression of the town’s identity so trees have symbolized this arbor town from the beginning. On a deeper level, the trees as portrayed in the artwork Arbor Winds are a metaphor for our own paradoxical fragility and strength in the context of our life cycles. We speak of having “deep roots” or of “branching out” or of how someone is “blooming”. After a long winter, the return to life of spring is expressed above all through the return of leaves to trees. We all feel the sense of being reborn in the spring with the blossoms and leaves and, in the autumn, the somewhat wistful sadness as the leaves reach their glory of color and then fall. 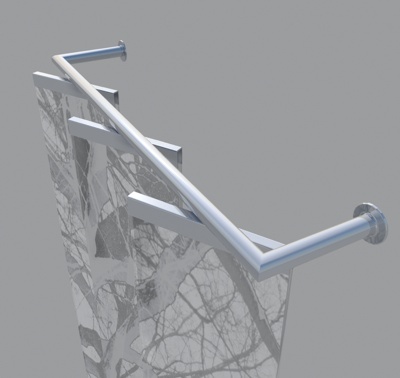 Arbor Winds evokes not just trees but wind and light as expressions of the energy that surrounds us. In each panel we see the ghostly afterimage as if the wind has blown the tree; we see both moments in time simultaneously. These images etched in glass are like those etched in our memories. We walk through a forest and it is our mental “snapshots” of the branches against the sky or the texture of the thick trunk, or the dense layers of the many trunks silhouetted against the forest underbrush that remain in our memories. Indeed each of these etched images is more the memory of moments rather than a physical reality: a subtle expression of our own ephemeral existence and the light traces we leave behind. During the April 23 meeting, Kotarski made the same presentation that he and Miller have given to other groups over the past few weeks. He explained the process that’s been undertaken, starting in 2011. “It’s been well-vetted,” he said. Bob Miller, chair of the Ann Arbor public art commission. Kotarski noted that the question of “why not a local artist?” comes up in almost every discussion. The reason is that the city attorney has said it’s not legal to limit the proposals to local artists, Kotarski stated. There are world-class artists living in the Ann Arbor area, he noted, so outreach was done to make as many people as possible aware of the opportunity. Seven Michigan artists submitted proposals, but none were selected as finalists. Miller noted that Widgery will be providing the LED light fixtures, and the city will be paying for the electricity. He reported that a city councilmember had asked whether the lighting will draw on solar power. That’s not a decision that’s within the purview of AAPAC, Miller said, but he liked the suggestion. Kotarski stressed, as he has during other presentations, that “not one single dollar of the money that goes to this artwork could possibly be used to fill potholes.” Although the money comes from the former Percent for Art program’s street millage funds, he contended that potholes are filled by funds from the state’s gas tax. “This is not a war of public art versus potholes,” he said. Devon Akmon asked about possible glare from the lights. Miller replied that since the lights will be pointing up, they won’t be shining into traffic or nearby homes. Jokes were made about the difference between that and the University of Michigan’s large electronic billboard in the same area. The recommendation will be placed on the council’s agenda for its first meeting in June – on June 2. 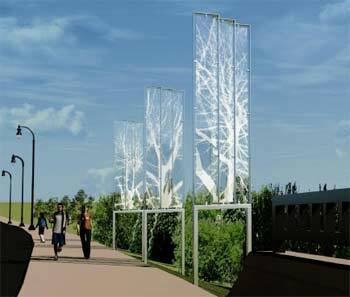 If approved, the art would likely be installed sometime in 2015. 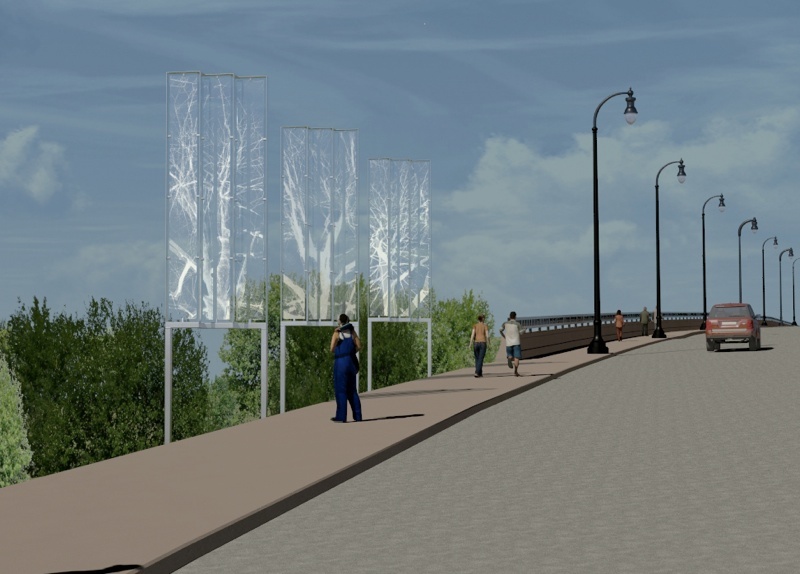 An image of proposed artwork by Catherine Widgery along East Stadium bridge. 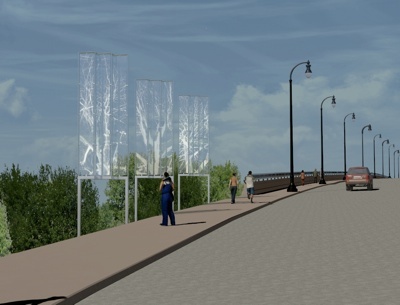 An image of proposed artwork by Catherine Widgery along the north side of East Stadium bridge. An image of proposed artwork by Catherine Widgery below East Stadium bridge, along South State Street. A detail of the louvers designed by Catherine Widgery. The etched glass panels will be attached to a metal frame. Outcome: Commissioners unanimously recommended approval of the project for East Stadium bridges. The recommendation will be forwarded to the city council for consideration. John Kotarski, AAPAC’s vice chair. Kotarski told commissioners that a friend of his, the artist Jim Pallas, is leaving the state and had asked Kotarski to help place his artwork. [Pallas is based in Applegate, Michigan, on the east side of the state.] 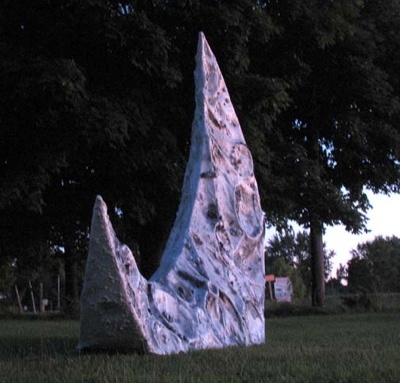 Pallas had intended to sell the work, but Kotarski said he persuaded Pallas to consider donating some pieces to the city of Ann Arbor. Kotarski said this idea appealed to Pallas, particularly because Pallas thought his work featuring moons was appropriate for Ann Arbor. “To him, moons are metaphors for dreams and dreamers, and he thought: What better place to situate these moons than Ann Arbor?” Kotarski said. Pallas imagines the city is a place of “dreamers dreaming world-class dreams,” Kotarski said. 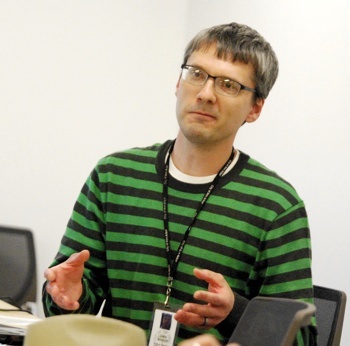 Kotarski described Pallas as a world-class artist, and noted that he had emailed commissioners more information on Pallas’ background, including professional references. [.pdf of references and reviews] [.pdf of Pallas resume] He said the work was valued at about $100,000. I had hoped to bring you a donation proposal with proposed locations for artwork which was completely vetted by all stakeholders, however municipal government moves slow and Jim plans to leave the state in four weeks. Hence, the last minute addition to our agenda. I think your knowledge of the process to date and my plans moving forward is appropriate now rather than waiting for a completely vetted proposal. I have kept Craig [Hupy] and Bob [Miller, AAPAC's chair] in the loop as I met with Susan Pollay, Jim Curtis, Colin Smith, and Ken Clein. My plan is to review safety, maintenance, and traffic flow with appropriate Justice Center and City Hall staff to insure all stakeholders are in acceptance of the artwork in the proposed locations. Jim’s daughter, Lydia Loren, is a law professor and international scholar in intellectual property rights who happens to have worked closely with our City Attorney, Steve Postema. Lydia and Mr. Postema have made arrangement to resolve any legal issues necessary to facilitate this donation. The process includes completion of a gift disclosure form and review of the proposed donation by a gift committee. Kotarski suggested that AAPAC could act as that committee, or that he could make recommendations for who would serve on the committee. He said he’s already worked to identify where the three donated pieces could be placed, and to work through any legal issues that the city might have. 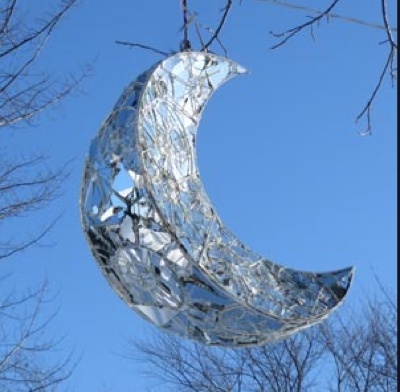 Fallen Moon by Jim Pallas is proposed to be located outside of city hall. Luna Maggiore by Jim Pallas is proposed to hang in the atrium of city hall. 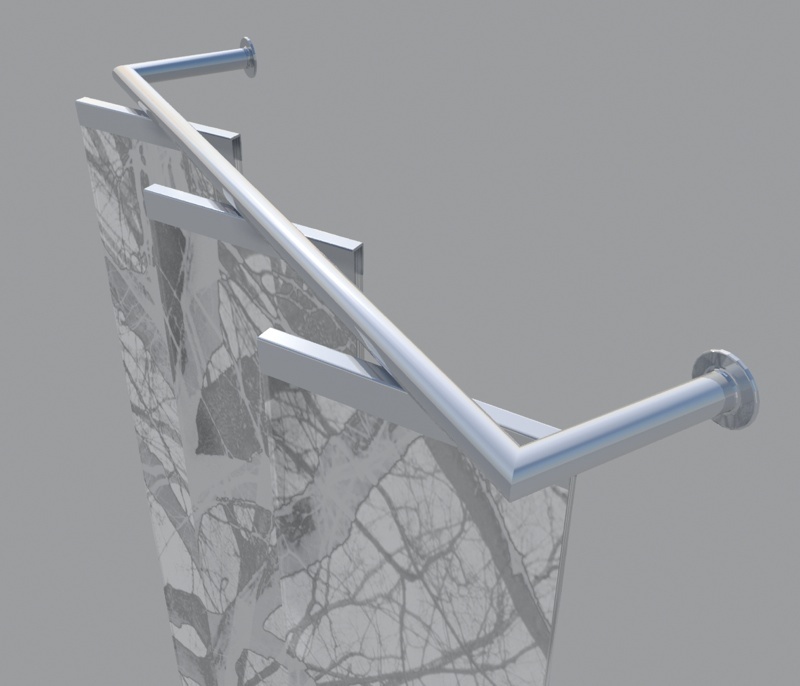 This piece by artist Jim Pallas, titled LAW, is proposed to be installed in the lobby of the Justice Center. Kotarski said he wanted to inform AAPAC about this opportunity. The city won’t accept these pieces without a recommendation from AAPAC, he noted. He wanted to know if commissioners thought they could make that recommendation within four to six weeks. If not, he’d help Pallas place the artwork elsewhere. Kotarski thought the work would “bring cachet to the city.” He said he’d toured the Justice Center with the building’s architect [Ken Clein of Quinn Evans Architects], and that several spots had been identified as appropriate. “He feels it’s consistent with and would enhance the building,” Kotarski said. 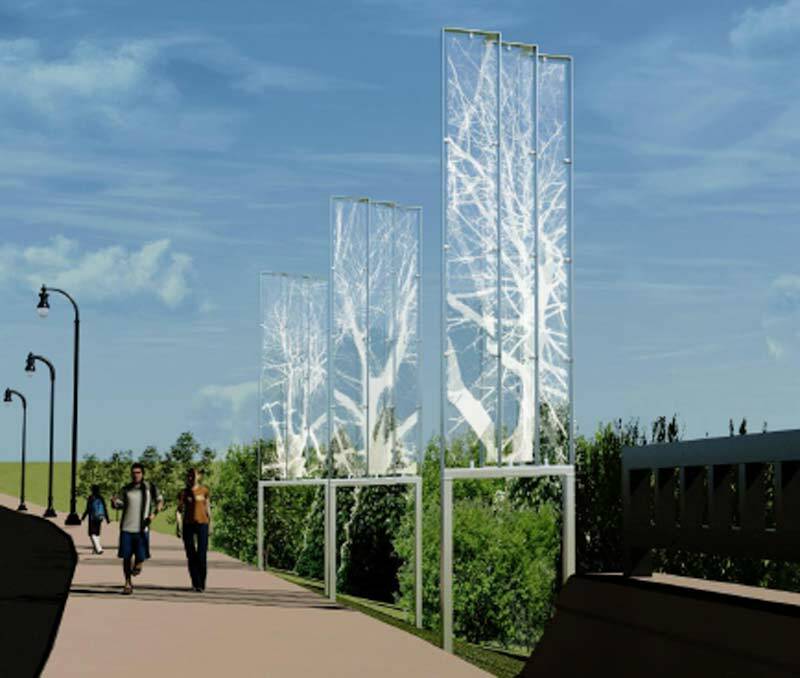 If the city agrees to place the artwork in the proposed locations, and agrees to pay for installation and maintenance, Kotarski said, he hoped that AAPAC would agree to recommend to council that the city accept these donations. Installation and maintenance costs haven’t yet been determined. Chamberlin noted that much of the information needed for the gift disclosure form is already available. A gift committee would need to be appointed, she said, and that group would make a recommendation to AAPAC. Chamberlin advocated for following this process. “I just think it’s important to be consistent,” she said. Kotarski said that UM and AADL each have a “committee of one” who makes a recommendation. 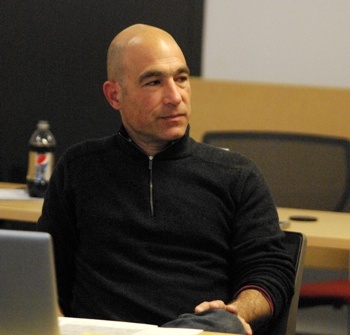 “If this [AAPAC process] doesn’t mirror that, you might want to think of revising it,” he said. The proposed locations aren’t debatable, Kotarski added. Chamberlin said that AAPAC’s role is to evaluate the artwork, not to recommend the locations. Bob Miller stated that most of the work has been done, and he thought it would be reasonable to follow the process within the timeframe of four to six weeks. When he suggested that Kotarski could appoint the gift committee, Chamberlin indicated that Kotarski had a conflict of interest. “I would feel that I had one, if I was bringing the artist forward and representing the artist,” she said. Miller replied that he didn’t think so, because Kotarski wasn’t benefiting from it. Upon receipt of a Gift of Art Disclosure Form, AAPAC will establish a Gift Committee as a subcommittee of AAPAC. The Committee will consist of a minimum of four (4) AAPAC members including: a member of the Committee who will act as chair, an appropriate community representative, an appropriate City representative, an appropriate artist dependent upon the scope of the proposed gift. Members of the Gift Committee will serve two (2) year terms. Kotarski wasn’t sure there was time to do this, but Miller assured him that it would be possible. 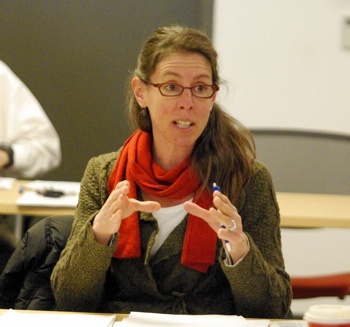 City councilmember Jane Lumm attended AAPAC’s April 23 meeting but did not formally address the group. Again, Kotarski stressed that AAPAC has the opportunity to get artwork donated by major Michigan artists. He said the Ann Arbor Downtown Development Authority is willing to give Pallas a $500 honorarium for each of the three donated pieces – “which is only reasonable, to recognize this value,” Kotarski said. One of the newest art commissioners, KT Tomey, brought forward a proposal for feedback: Maps for walking or running tours of public art. 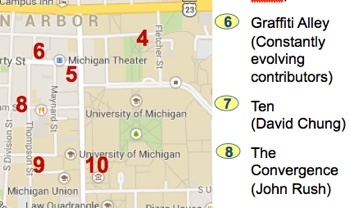 Detail of a draft map of public art in downtown Ann Arbor and the University of Michigan’s central campus. Links to .pdf of full map. She’d been inspired by an “art run” that AAPAC chair Bob Miller had put together, which she had used for her running group. “It was wildly popular – people are still talking about it, wanting to do it again this summer,” she said. In doing research to add to the next run, Tomey said she was surprised that there wasn’t one coherent map of art in Ann Arbor that people could easily access online. There’s a resource for art on the University of Michigan’s north campus, she noted, but it’s not easy to use to find out about the artwork. Tomey first laid out what she called her “grand vision” for this project. There could be online .pdf maps with links to more information about each piece of art. But she also envisions a mobile app that people could load onto their phones, so that they could look at the map and information about public art as they’re walking or running. Eventually, she’d like to do a video tour that could be self-directed or used to train people who’d give tours in person. 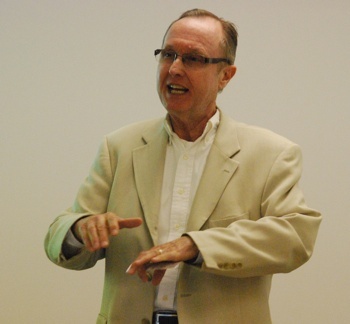 The tours would serve multiple purposes, Tomey said, such as promoting art and increasing connections with the community. Tomey asked commissioners for feedback on the overall idea, as well as changes that might be made to the draft maps. Craig Hupy, the city’s public services area administrator, offered to provide support from the city’s GIS staff in designing the maps. He also said the city’s communications staff can help promote the project, when it’s ready. Commissioners Devon Akmon and Marsha Chamberlin. Commissioners expressed enthusiasm for the project. Devon Akmon suggested looking for partnerships with the UM business school or computer science department to help with the mobile app. Regarding map templates, he noted that D:hive in Detroit has developed brochures and maps that might be helpful. John Kotarski suggested contacting UM’s Council for Disability Concerns, which is interesting in making public art accessible for people with disabilities. Marsha Chamberlin said there might be grants available to support this project from the Michigan Council for Arts & Cultural Affairs. She also thought the project might be of interest to the Ann Arbor Convention & Visitors Bureau, which is funded in large part by a local accommodation tax. Tomey said she’d thought about identifying routes of different lengths for runners – both for local residents as well as visitors. “When you visit a city, you look up the running routes,” she said, and that could be another way to promote public art to visitors. Jim Simpson suggested taking a phased approach, starting with maps that could be put up quickly. He offered to help with implementing the project. Aaron Seagraves, the city’s public art administrator, said .pdf maps could be posted on AAPAC’s website. Seagraves also recommended that the commission add this project to its list of ongoing work. Chamberlin pointed out that AAPAC no longer has available funding and that staff support is unclear after Seagraves’ contract ends on June 30. She wondered whether AAPAC would be able to get any support from the city for projects like this. Hupy indicated that there would be some kind of ongoing support for this project. Aaron Seagraves, the city’s public art administrator. The plan includes projects that are already underway, as well as proposed capital projects to be enhanced with public art. The ongoing projects are: (1) artwork for East Stadium bridges; (2) public art at Arbor Oaks Park; (3) Canoe Imagine Art; and (4) the Coleman Jewett memorial. The proposed enhanced capital projects are street and sidewalk stamping, painting or stenciling in four locations to be determined, for a total cost of $30,000. The city council would need to approve these projects before they would move forward. 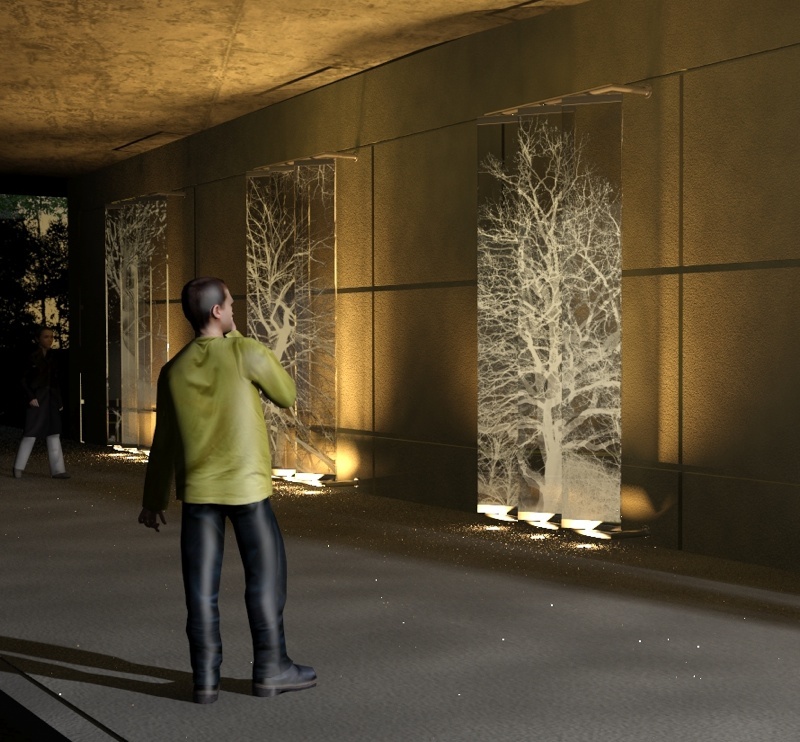 City staff would be involved in developing guidelines for these installations to “ensure the artwork will meet all applicable codes, are safe for all pedestrians and are compatible with the maintenance of the infrastructure,” according to the plan. Make plans to use gifts, grants, crowd funding and other non-local government funds for public art in Ann Arbor, as the amended Public Art Ordinance allows. Increase public outreach for long-term public art program goals, artwork selection, and artwork education and thus better carry out the duties of the Public Art Commission established by the Ordinance amendment of June, 2013. Refine the selection of potential public art projects by using a project evaluation and prioritization model and base the initiation of projects on the evaluation of primary criteria. Establish an open and regular channel of communication regarding public art program updates with city administration and City Council. Review the location of the arts program within the City of Ann Arbor government and evaluate the possibility of relocating the public art program. Fulfill the Public Art Task Force’s recommendation of creating a position for a full-time public art staff person. Review and revise the Public Art Commission’s Bylaws and Guidelines. Discussion was brief. Kotarski thanked Seagraves for his work on this plan, saying it shows the work that AAPAC has been doing “even though juggling public criticism.” It tells the council that AAPAC has heard the city council’s charge for the commission, he said. Seagraves noted that the plan will be sent to the council in time for their deliberations on the FY 2015 budget. City administrator Steve Powers presented a draft budget at the council’s April 21, 2014 meeting. The council will discuss and approve the budget, with possible amendments, at its May 19 meeting. Outcome: Commissioners voted unanimously to approve the FY 2015 annual public art plan. It will be forwarded to the city council. The April 23 agenda included an item to approve applying for a $10,000 National Endowment for the Arts Challenge America Fast Track grant. 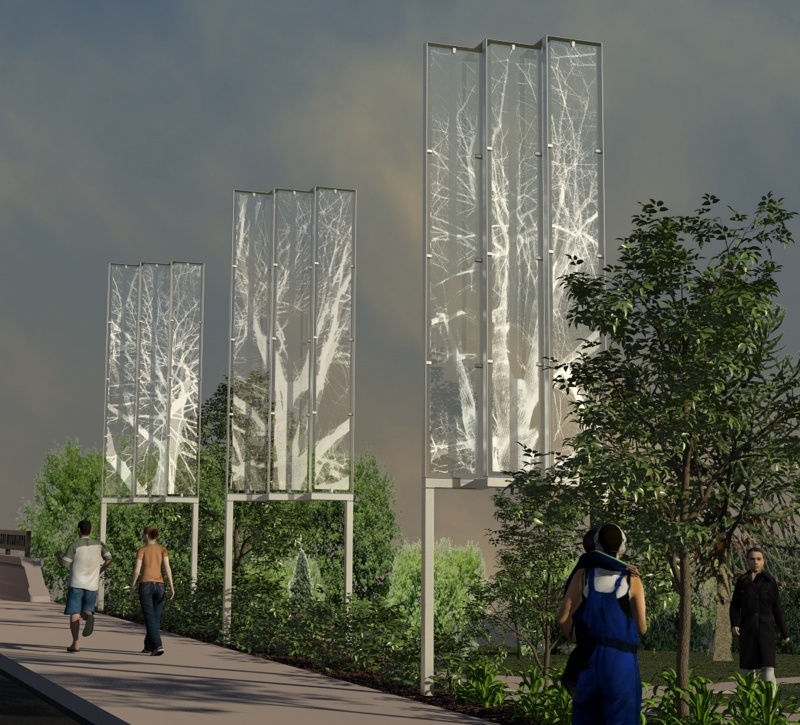 The money, if awarded, would require matching funds in an equivalent amount from other sources for a public art project at Arbor Oaks Park in southeast Ann Arbor, located near Bryant Elementary School and the Bryant Community Center. The effort is in partnership with the nonprofit Community Action Network, which runs the Bryant Community Center under contract with the city. The idea is to create concrete and mosaic sculptures near the five entrances to the park, to help link the school and different streets in the neighborhood. The artwork would involve residents and students at Bryant Elementary. Aaron Seagraves, the city’s public art administrator, described the small- to medium-sized sculptures as wayfinders. The grant application is due on May 8. Nick Zagar is the commissioner who’s taking the lead on this project. He did not attend AAPAC’s April 23 meeting. Outcome: Commissioners unanimously voted to approve the application for this NEA grant. Commissioners were updated on projects that are currently underway: (1) Canoe Imagine Art; (2) the Coleman Jewett memorial; (3) sculptures at a rain garden at Kingsley & First; and (4) a possible mural at Bach Elementary. Craig Hupy, the city’s public services area administrator. The community art project is intended as a temporary art display in downtown Ann Arbor using old canoes from the city that would be repurposed as public art. The installation of an estimated 25-30 canoes was to take place in fiscal 2015 or 2016, depending on funding. The project has received a $21,000 grant from the Michigan Council for Arts and Cultural Affairs, and organizers plan to raise additional funds from private donors. AAPAC originally approved $10,000 in funding for the project, at its Sept. 25, 2013 meeting. It was to be used as a portion of matching funds for the state grant, with the remaining $11,000 in matching funds to be raised through donations. However, the city council voted to allocate the entire $21,000 in city funds to match the state grant. That action came at the council’s March 3, 2014 meeting. 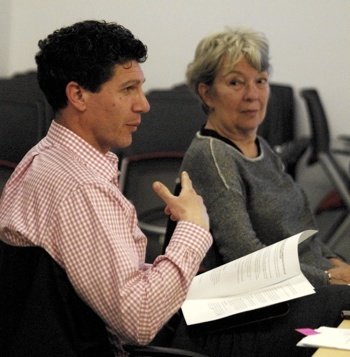 At AAPAC’s April 23 meeting, Craig Hupy – the city’s public services area administrator – reported that the project was intended as a three-party effort involving the city, the CVB, and the Ann Arbor Area Community Foundation. 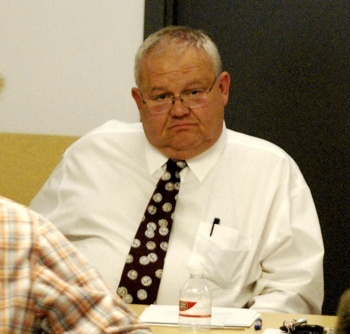 “We are struggling with the other partners not wanting to administer the contract,” Hupy said. As of July 1, which is the start of the city’s next fiscal year, there won’t necessarily be funds for art administration, he noted. Chamberlin said it wasn’t until December of 2013 that the city attorney’s office informed her that the project couldn’t use a website that was separate from the city’s website, and that an RFP process must be used for seeking artists. Also, she learned that this effort would be required to hire a project manager. At the time, they were hoping to move the project forward more quickly, and so the idea of a “triumvirate” partnership was explored. Now, however, the timeline has been pushed back, but it’s unclear who will lead the project, she said. Jim Simpson, AAPAC’s newest commissioner. Hupy added that if another organization takes the lead, then the city’s procurement process – including issuing an RFP – wouldn’t be required. He also noted that the state grant must be spent by the end of September 2014, and it wasn’t clear if that would be possible. And because all the funding hasn’t yet been raised, the city won’t take on responsibility for a project that it doesn’t have the ability to fund completely. “We’re trying to make it work, but I can’t even say that I’m cautiously optimistic at the moment,” he said. 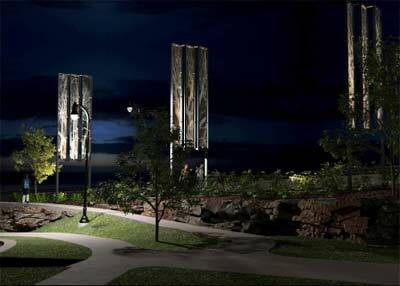 Aaron Seagraves, the city’s public art administrator, reported that a request for proposals (RFP) has been drafted to solicit bids for the Coleman Jewett memorial. The RFP is being reviewed by legal staff. The memorial will be a bronze replica of an Adirondack chair made by Jewett, to be located at the Ann Arbor farmers market. 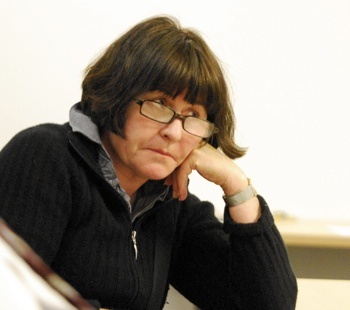 Jewett was a long-time local educator who died in January of 2013. After he retired, he made furniture that he sold at the farmers market. AAPAC has committed $5,000 in city funds to the project, which now has a total project budget of $50,000 – up from its original estimate of $36,000. Other funds will be raised from private donations, including a contribution from the Old West Side Association. So far, $18,795 has been raised, not including the city’s $5,000 contribution. 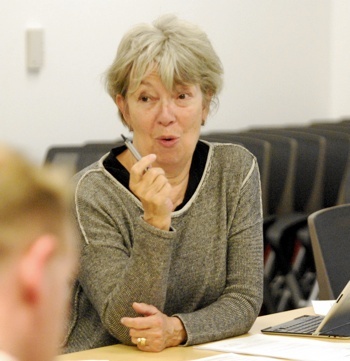 Marsha Chamberlin, who’s spearheading the project, gave an update on fundraising efforts. A second mailing to solicit donations is being sent out this month. An alumni party for Tappan Middle School – where Jewett served as assistant principal – is being planned as a fundraiser, possibly at the Old German. Information will be passed out at the farmers market, although no solicitation is allowed there. The installation of sculptures in a rain garden at the southeast corner of Kingsley & First will start in May. The entire project, including the rain garden, will be completed by the end of June. 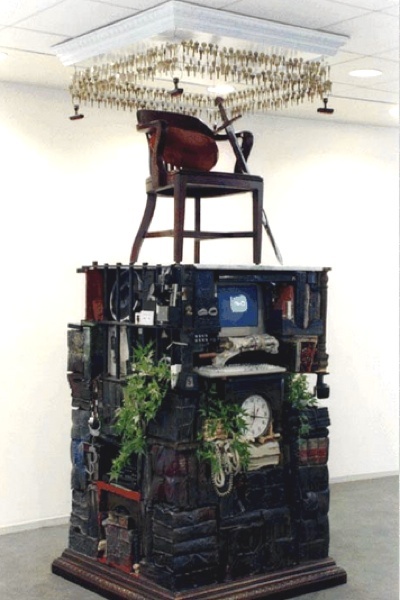 The artist, Joshua Wiener, will be coming to Ann Arbor during the first week in June. Aaron Seagraves, the city’s public art administrator, reported that Wiener will be available for a public event, likely on June 3. Promotion for the project is being planned. As part of that, one idea is to ask the public to name the artwork, Seagraves said. The rain garden is already named after Ruth Williams. It’s considered by the city to be a “stormwater feature,” not a park. 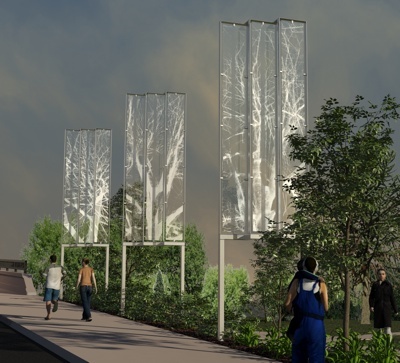 The Denver artist is working with landscapers to incorporate public art into the new rain garden, which is in a floodplain. The project has a $27,000 budget, though the artist’s contract is for $23,380. Wiener’s sculptures show the outlines of five fish. They’re small mouth bass, in different sizes, made of white epoxy-painted steel and pointed toward the Huron River. Josh Wiener’s rendering of fish sculptures for the rain garden at First & Ashley. Bob Miller reported that not much progress has been made on a public art project at Bach Elementary School, on the city’s Old West Side. He’s been working with the school principal Hyeuo Min Park, the school’s art department, local artist David Zinn, the AAPS maintenance staff and others to paint a mural on a concrete wall at Bach’s playground. It’s a place that gets tagged with graffiti, he noted. Miller said it could be a pilot for other projects, if it moves forward. Commissioners present: Devon Akmon, Marsha Chamberlin, John Kotarski, Bob Miller, Jim Simpson, Kristin “KT” Tomey. 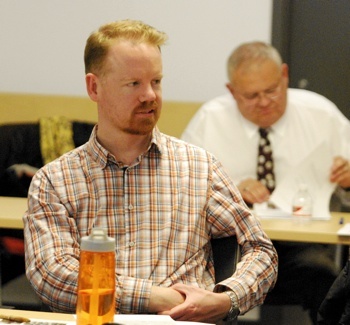 Also: Aaron Seagraves, the city’s public art administrator and Craig Hupy, public services area administrator. Absent: Ashlee Arder, Connie Brown, Nick Zagar. The Chronicle relies in part on regular voluntary subscriptions to support our artful coverage of public entities like the Ann Arbor public art commission. Click this link for details: Subscribe to The Chronicle. I wonder if the Visual Arts Council at the Neutral Zone could help coordinate the Canoe Imagine Art project? Obviously I don’t know what all is involved in the effort, but I know the VAC has done some small-scale installations for other groups. Why does Jane Lumm always look so glum? @2: Because that’s what you choose to see.